Foundation Myths was a new commission by Ordinary Architecture, an art, architecture and design practice with an international profile. 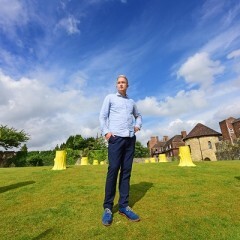 The installation, produced especially for the Artists Garden at the rear of York Art Gallery, drew on the rich history of the site and its many uses over the centuries. 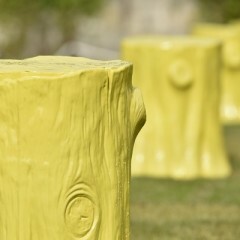 Ordinary Architecture created ten bright yellow ceramic tree trunks varying in height positioned in parallel rows. The forms were inspired by the persistent myth that architecture evolves directly from nature, refering to the area’s former use as an orchard as well as the ruins of St Mary’s Abbey within the abbey precinct. 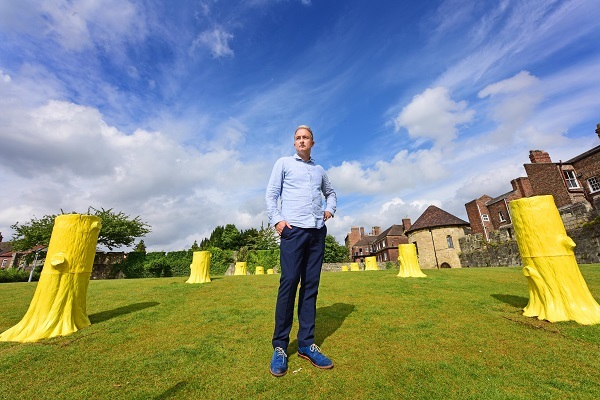 This was the first work to be shown in the Artists Garden; a space of two acres which was created as part of the gallery’s major redevelopment project, reopening to the public on 1 August 2015. 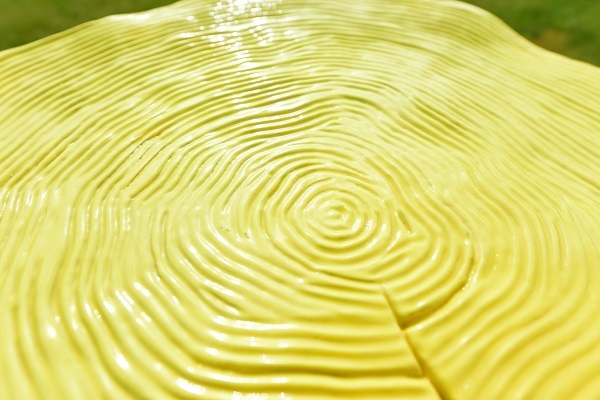 Ordinary Architecture is a practice started in 2013 by Charles Holland and Elly Ward. The practice’s name refers to an interest in the everyday and a desire for their work to reflect critically on the world around us. Their work includes art, architecture and design projects in the UK and US, including the design of the Pavilion of the Applied Arts at the Venice Architecture Biennale 2016 and a public art installation in Los Angeles. Clients include the Victoria and Albert Museum, Living Architecture, HAB, and the London Design Festival. Prior to starting Ordinary Architecture, Charles and Elly worked at FAT Architecture where Charles was a director. While at FAT, Charles was responsible for a number of the practice’s key projects including the Nonument permanent public artwork in Holland, Thornton Heath Library in London, and A House For Essex, the practice’s creative collaboration with Grayson Perry. 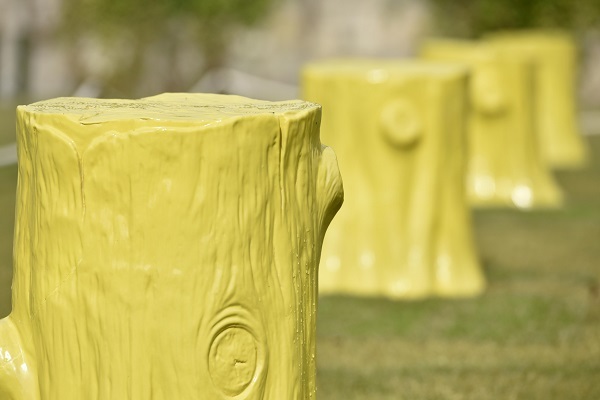 The title of the installation, Foundation Myths, refers to the frontispiece of Marc-Antoine Laugier’s Essay on Architecture, which depicts the first architectural structure as an assemblage of tree trunks. The idea that architecture evolves directly from nature into a representational language of construction is referenced in the installation as a powerful tool to evoke the site’s history of use, cultivation and building. 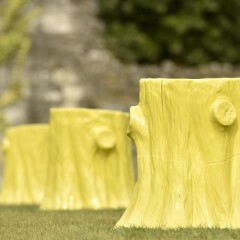 Specifically the installation takes the form of two parallel rows of tree stumps. 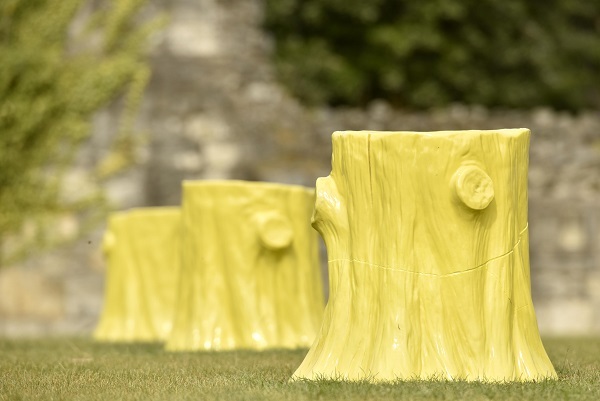 Whilst the trunks themselves are rendered in a naturalistic manner, their arrangement is more formal, suggesting the foundations or remains of an architectural structure. The origins of the site and its various buried or vanished histories are thus playfully evoked. The trunks offer places to sit, so as well as recalling the remains of previous structures they also suggest an architectural interior. They are made of glazed ceramic, relating them directly to the gallery’s significant collection of ceramics at the Centre of Ceramic Art (CoCA). The trunks appear both natural and artificial, at home and surreally out of place. They can be read as over-scaled domestic ornaments or the petrified remains of a grove of trees, or the column bases of a former building. Their shiny, colourful surfaces reflect the colours of the garden around as well as providing a contrast to the natural textures of the landscape. It is left deliberately ambiguous as to whether the trunks are the relics of something lost or the start of something new. The Artists Garden is situated within the original abbey walls at the rear of York Art Gallery. 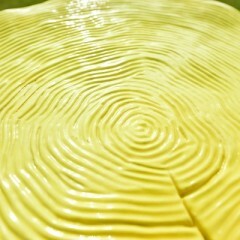 Together with the Edible Wood, it was created to coincide with the £8 million development of York Art Gallery. The two acres of land was previously closed off to the public, but now links with the original York Museum Gardens, Marygate as well as Exhibition Square through a new snickleway to the side of the gallery. Foundation Myths was the first commission for the site, which will be used to display new and exciting contemporary artworks for free.